Internet Brands June 26, 2018 Comment Now! In the age of YouTube, an exotic carmaker needs exciting overhead tracking video of its latest automotive thunderbolt to thrill online fans. McLaren Automotive ran into unexpected difficulty getting that shot. 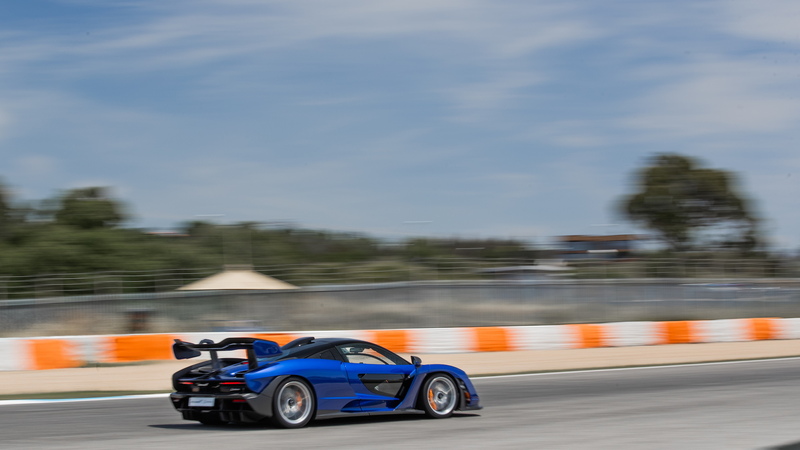 The McLaren Senna’s extravagant wings, spoilers, splitters, vents, and ducts so thoroughly battered the air that McLaren’s video drone crashed in the car’s turbulent wake, unable to surf the waves and vortices pouring from the car’s carbon fiber bodywork. So, while there is plenty of important hardware to discuss including the RaceActive Chassis Control II linked hydraulic suspension system, the Monocage III carbon fiber chassis tub, the 789-horsepower M840TR twin-turbo 4.0-liter V-8 engine, and 7-speed Seamless Shift Gearbox, the Senna’s fundamental story is aerodynamics. McLaren Automotive, you’ll recall, is the street car production branch of the McLaren Group that also includes McLaren Racing, the fabled Formula One team that won 12 world driver’s championships and 182 grands prix, the second-most victories in F1 history. Ayrton Senna was McLaren’s most decorated driver. The Brazilian won three of the team’s world championships and scored his maiden F1 victory at the Estoril race circuit in Portugal. It's fitting that we've come to Estoril for our first drive of the Senna. 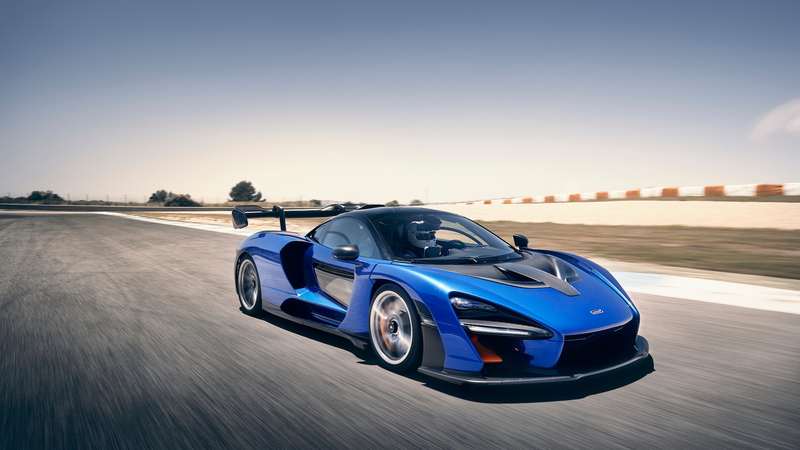 McLaren calls Senna the ultimate street-legal track car. It is built on an evolution of the Monocage II carbon fiber tub employed by the 720S, but with reinforcement that closes off the area immediately behind the seats, and it’s the stiffest chassis McLaren has built yet. One casualty is rear visibility. The 720S may be compromised to the direct rear, but the Senna only has a letterbox opening. As the team that introduced carbon fiber to F1 in 1981, McLaren is master of the technology now. That is why the Senna weighs only 2,640 pounds dry. Compare that to 2,822 pounds for the Ferrari 488 Pista, a similarly track-centric beast. The benefit of light weight is obvious during rapid changes of direction or when braking from high speed. Less mass makes both of these tasks easier. How much easier isn’t obvious, though, because of the assistance provided by the active aerodynamic systems and the active suspension, both of which are programmed to be invisible to the driver other than the stupendous performance. “We aimed to make the car so that every person can drive it to the best of their ability,” explained chief test driver, retired IndyCar racer Kenny Brack. Linear, progressive, predictable response is the key to driver confidence, and those were the traits McLaren programmers built into the Senna’s electronic assistance systems. “The driver shouldn’t know what is happening with the wing angle,” for example, Brack said. McLaren’s engineers tell us that the towering rear wing (reminiscent of the ones on the Huracan Performante and Corvette ZR-1) banks upward at a steep angle while cornering and under braking, to help stick the Senna to the track. And like the Drag Reduction System on F1 cars, the wing automatically flattens out into a lower-drag configuration for high-speed driving. The car has to be balanced, front-to-rear, so hiding up inside the ducts beneath the front bumper are active dive planes (McLaren calls them aero blades) whose action mirrors that of the rear wing, though we can’t see them in action. 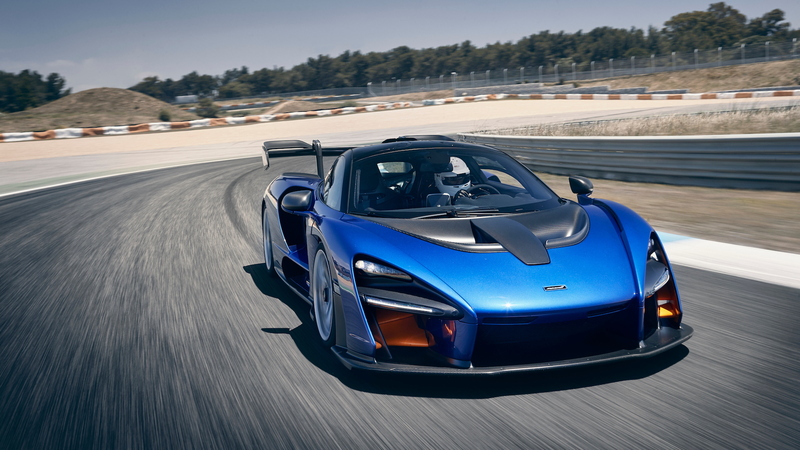 Even with the active devices laying flat for less drag, the Senna generates 1,764 pounds of downforce at 155 mph. That’s 40 percent more than the McLaren P1 hypercar, and plenty to settle the car when braking or turning at speed. The Senna’s twin-turbo 4.0-liter V-8, internally dubbed M840TR, churns out an extra 89 horsepower over the version of the engine in the 720S. The extra power comes in part from the overhead snorkel intake (Hey, what’s the Senna’s water fording depth?) and a free-flowing titanium-Inconel exhaust system that sounds like it is blasting hellfire out the triple tips beneath the rear wing. The engine’s grunt launches the Senna like a Dodge Demon, rocketing to 60 mph in 2.7 seconds and stopping the clock in the quarter-mile in an astounding 9.9 seconds. Top speed is 208 mph, and with McLaren’s pro drivers at the wheel, it circles Estoril six seconds faster than the 720S. McLaren took suitable precautions before unleashing journalists at Estoril: fireproof underwear and socks, full firesuit, racing shoes, pristine white Bell helmet, HANS, and gloves. Rather than the regular seat belts, I strapped in with a five-point racing harness, cinched tight enough to squeeze my breath out. Finally, a technician leaned in to connect my helmet’s earphone and microphone, so that a pro driver known only as Mark could communicate clearly while supervising my drive from the right seat (“Roger that Houston, go with braking at 180 meters”). For the track test, I’m instructed to set the Senna’s systems to “Race” mode, which means, among other things, that the hydraulic suspension lowers the car 1.5 inches closer to the ground for more effective performance from the front splitter and rear diffuser. Again, it is always about the aero. Race mode also configures the hydraulic suspension’s stiffness and resistance to roll, pitch, and dive to track-suitable levels. Pulling the Senna’s dihedral door shut gives me the feeling of closing the hatch on the SpaceX Dragon capsule for a flight to the International Space Station. The Gorilla Glass panels in the door’s side and top enhance the impression of Scaled Composites-style aerospace construction. I ignite the Senna’s fire by pressing the start button on the overhead console. McLaren moved some other switches there too to eliminate them from the doors, and this also contributes to the space capsule atmosphere. The engine fires to a raucous note, underscoring the track-ready exhaust and the absence of sound insulation in the cabin. The inside of the car is surely noisy in a way that would be tiresome during regular driving, but because all of my time in the Senna is spent wearing a balaclava and helmet with a radio in my ear and driving as hard as possible, the presence of noise doesn’t really register. I engage the dual-clutch 7-speed transmission by pressing the “D” button on the lower console and then aim the steering toward the pit exit. Two clicks of the right-side steering wheel-mounted shift paddle put the car into third gear as it gathers speed onto the track. Once the Pirelli P-Zero Corsa R tires are up to temperature (by the end of the out lap) I begin to press, looking for evidence of the Senna’s capabilities. It doesn’t take long, as the belt-stretchingly effective carbon ceramic brakes (aided by the active downforce) slow the car at an astounding 2.1 G’s. The Senna engages the anti-lock brake assistance almost imperceptibly, to avoid unsettling drivers who aren’t used to activating the system. The downforce helps the Senna maintain a straight line despite the ferocious deceleration, with no darting about as the tires scrabble for grip. It is also worth mentioning that McLaren’s carbon ceramic brakes (15.35-inch rotors all around with six-piston front calipers and four-piston rears) don’t squeal and aren’t grabby at pit lane speeds, so the Senna won’t embarrass you like a 488 Pista might. Carbon-fiber wheels are optionally available, but they aren’t standard because their spokes are prone to deflection at the extreme loads possible in the Senna, and that introduces a vague feeling into the steering response, according to vehicle line director Andy Palmer. 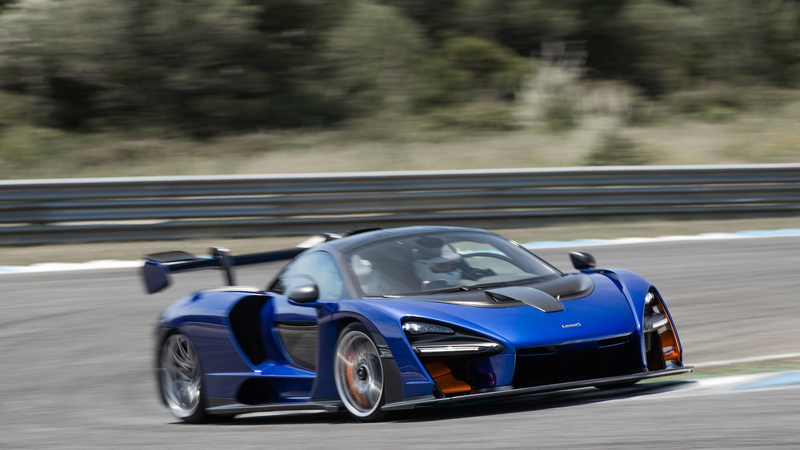 The Senna turns into corners with directness and precision, thanks in part to McLaren’s reliance on hydraulic power steering (powered by an electric motor rather than a belt from the engine), which is still better than electric power steering for conveying information from the tires to the driver’s fingertips. MORE: Why did McLaren name its latest supercar Senna? The steering rack has a quick racecar-like ratio that keeps on-track maneuvers within a single turn, so I don’t have to move my hands on the wheel during the course of a lap. This is especially important because of McLaren’s use of easily accessible steering wheel-mounted shift paddles. The transmission connected to those paddles is similarly ideal. The shifts are instantaneous and slick as Portuguese olive oil. In Race mode, the transmission defaults to a manual shift mode, but it can be set to shift automatically. The aerodynamic downforce surely contributed to the Senna’s confidence-inspiring stability in the just-lift-and-go Turn 2 and the flat-to-the-floor Turn 5, though the car understeered through the slightly uphill Turn 3. The car’s suspension is tuned to work on all kinds of different tracks, and unlike a real race car, the Senna lacks the adjustability to try to dial it in for this track specifically. McLaren’s engineers have to tune the Senna to be neutral and manageable, not wanting any of the Porsche Carrera GT’s reputation for razor’s-edge handling, so it leans toward understeer. 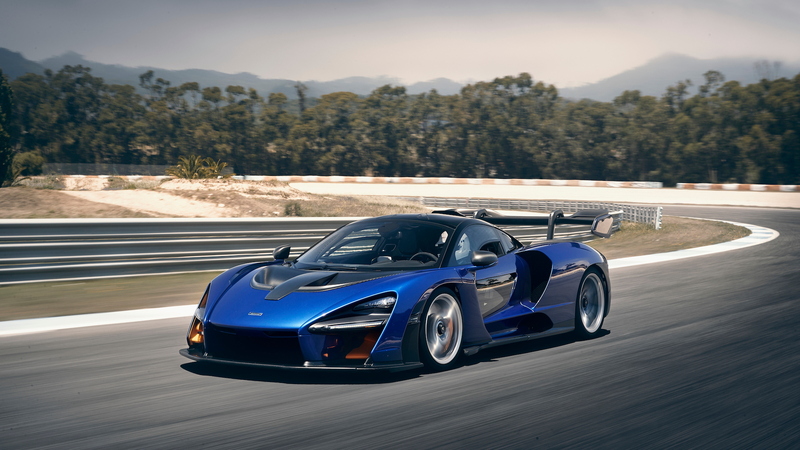 Any car with 789 horsepower gives the driver the ability to provoke oversteer with a jab of the throttle, so that problem’s easily solved in the Senna. I do detect a touch of power oversteer exiting the Turn 6 in third gear, and without lifting, correct it with a brief right flick of the steering wheel. It feels unremarkable and as if I don’t lose any time making the correction, but considering the Senna’s vast capabilities and subtle interventions, I’m left to suppose that the rear wing stood up to stick the rear tires for me. Whatever the degree of unseen assistance the Senna provides, the result is that this car makes the driver feel like a hero, all the way up to my 175 mph top speed. Yeah, that sounds like what the guy who wants you to buy the car would say, but it doesn’t make it any less true. Besides, they don’t need new buyers: all 500 Sennas are already sold. About one-third of them likely are coming to the U.S. So that’s actually good news for you, right? Because that’s $958,966 you’ll have left to spend on McLaren’s next ultra-performance sports car. Plus, maybe your drone will last longer than McLaren’s did. McLaren provided travel and lodging for the Internet Brands Automotive contributor to bring you this firsthand report.